Brian Reape hit the clinching goal five minutes from time as Mayo recovered from a four-point interval deficit to claim victory in their opening Division 1 match of the season at MacHale Park. Three points from Jason Doherty in the second period hauled Mayo back into the lead before Reape struck. Shane Killoran saw his shot deflected into the net five minutes into added-time, but it wasn’t enough for Roscommon, who had Ultan Harney sent off for two yellow card offences in the last five minutes. It’s hard to recall a game played in worse conditions as the wind and rain battered MacHale Park and handling errors, wides and slips were seen from start to finish. Roscommon captain Enda Smith won the toss and chose to play with the wind advantage in the first-half, and while it certainly helped them earn dominance, it was little help to them in front of goal as they reached half time with five points and six wides. But Mayo only managed one score in that opening period, and it arrived from an Evan Regan free in the third minute after he was fouled. From there to the break Roscommon bossed the encounter. They were air tight in defence, broke up several Mayo attacks with their tenacious tackling and won the battle at midfield. Roscommon’s scoring started in the fourth minute when Colin Compton swung the ball over from the left, and an Enda Smith free and Shane Killoran score soon followed for Anthony Cunningham’s side. Cathal Cregg was denied a goal when Robbie Hennelly tipped his dipping shot over the bar in the 14th minute, which put Roscommon three ahead, while Donie Smith pointed from almost halfway four minutes later. But that proved to be the last score of the first half as Roscommon started to accumulate wides and Mayo continued to struggle to create chances. Cregg should have hit the game’s first goal minutes from the interval when Hennelly mis-controlled the ball, but shooting off the ground and on the turn, Cregg’s short flew wide. 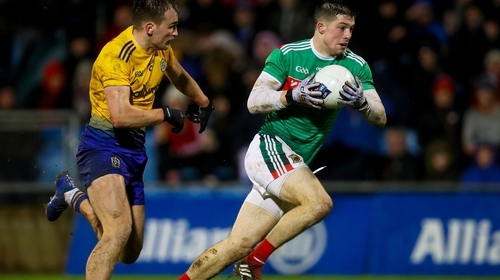 There was no let up in the strength of the wind at the interval so it was no shock to see Diarmuid O’Connor end Mayo’s scoring drought with a fine point in the 37th minute, but when they also added three wides to their tally early on it was clear how tough it was to cope. Mayo brought their wides tally to five in the first 15 minutes after the interval, but back-to-back Jason Doherty frees from outside the 45 metre line soon pulled them to within one point of their visitors. On a rare foray into Mayo territory Colin Compton fisted a point, although Donie Vaughan cancelled it out immediately at the other end. Mayo’s dominance was threatened when Boyle was black carded when he pulled down Harney, but despite being a man down Paddy Durcan landed the leveller with 11 minutes to go. Full-back Brendan Harrison roamed forward to score the lead point for Mayo. Doherty then scored his third before Reape rattled the net. Mayo: Robert Hennelly; Eoin O’Donoghue, Brendan Harrison (0-01), Keith Higgins; Lee Keegan, Colm Boyle, Paddy Durcan (c) (0-01); Diarmuid O’Connor (0-01), Donal Vaughan (0-01); Fergal Boland, Aidan O’Shea, Jason Doherty (0-03, 0-02f); Evan Regan (0-01, 0-01f), Brian Reape (1-00), Conor Diskin. Subs used: Andy Moran for Boland (half-time); Stephen Coen for Vaughan (69); Fionn McDonagh for Diskin (71); James McCormack for Boyle (73). Roscommon: Darren O’Malley; Evan McGrath, Conor Daly, Gary Patterson; Conor Hussey, Niall Daly, Ronan Daly; Tadhg O’Rourke, Enda Smith (c) (0-01); Niall Kilroy, Shane Killoran (0-01), Donie Smith (0-01); Colin Compton (0-02), Ciaran Lennon, Cathal Cregg (0-01).